The elegance of a bridal dress. Each bride has her own individual taste and style, and going bridal dress shopping can at times be very hard. But then the final decision is made and the dress fits like a glove. Having the honor and privilege to capture that clients most prized possession is huge for me. I always try to put a little spin on it, to create that wow factor in the image. That takes me to this year wedding were I photographed this dress at the amazing Murdock Castle, wow is all I can say, too many amazing opportunities as a artist to create those one of a kind images, this venue is beautiful it is like stepping into medieval times, again. So many different rooms with various amount of light coming threw different shaped windows. I had asked a couple of bridesmaids to help with with photographing this dress. 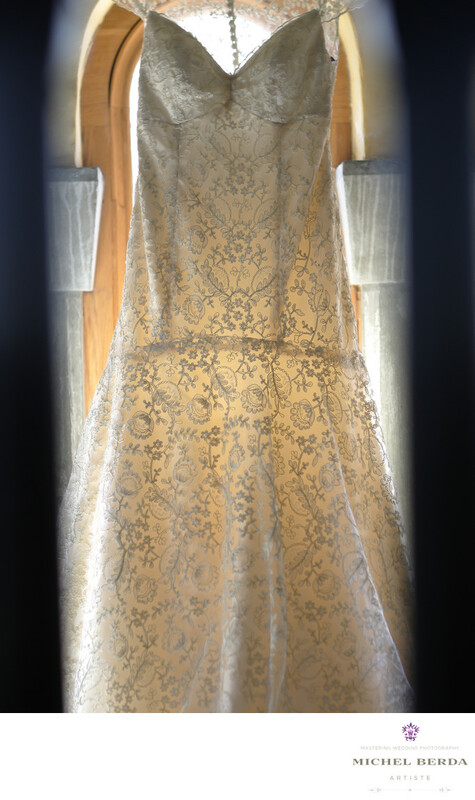 We had taken the dress outside, but then I saw the perfect light, so I put the dress there behind it was the very nice window light, the dark columns of Murdock Castle where the perfect vignette for the edges. I love the entire image, the dress is not blown out the collums on the side can be seen and the mood of the image is perfect it represent the dress very well.Keywords: Sullivan Island Murdock Castle (3).